Ask anyone who has been around the Nerf blaster scene for any length of time and they’ll tell you the same thing: Nerf darts are for noobs. It’s not that foam darts are bad—the squishy foam darts from Hasbro’s Nerf brand created an entire toy blaster category virtually overnight, so give some credit where it’s due. 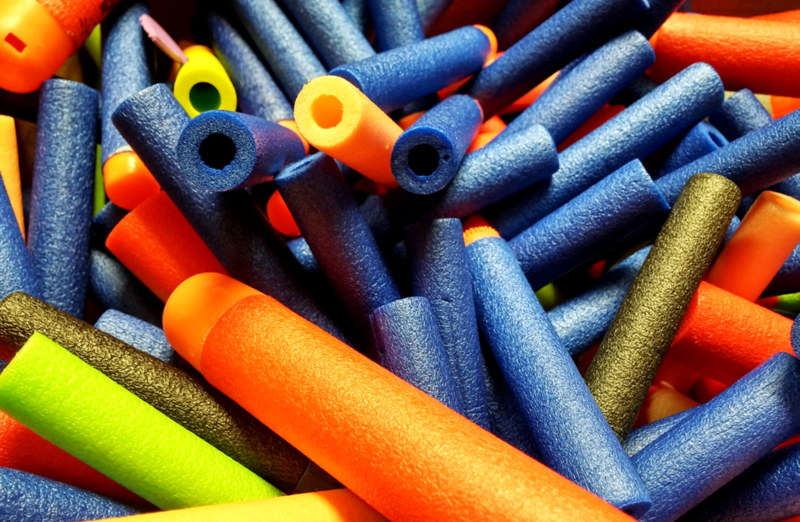 But once the initial thrill of shooting harmless (but wayward) foam bullets has worn off, you may wonder if other types of foam darts work better. As it turns out, you can get better performance out of your Nerf blaster, simply by changing your brand of darts. Darts with higher mass tended to be more accurate, but with shorter flight distances. The favorite dart for accuracy was the Buzz Bee Extreme. This dart weighs 1.67 grams compared to a typical Nerf dart that weighs just 1.00 grams. This extra weight kept the Buzz Bee dart more stable in flight than any other foam dart, which leads to much greater accuracy at the expense of ultimate distance. Darts with lower mass tended to fly farther, but with less accuracy. The favorite dart for distance was the X-Shot Excel, which tipped the scales at just 0.85 grams, compared again to Nerf Elite darts at a full 1.00 grams in weight. This dart was not very accurate, however. Off-brands such as the generic, “Koosh”-type darts can be a good middle-ground, weighing around 1.22 grams and providing a bit more stability, even if ranges were a little below the Nerf standard. For the best all-around performance, you have to look outside the Nerf camp and consider BOOMco Smart Stick darts, which are extremely accurate and highly durable. If Nerf compatibility is not a requirement, BOOMco darts are currently the best-designed toy blaster darts on the market. While the Buzz Bee Extreme darts work well for the front-loading blasters in which they are compatible, there are a number of blasters for which a different type of clip-compatible option is a must. Much has been made on Nerf forums about so-called “Koosh” and “Voberry” darts (among others) for clip blasters. These are typically generic darts from China that are sold on eBay and Amazon, and that vary in quality from lot to lot, and from seller to seller. They can offer improved performance versus standard Nerf Elites, but it’s a “buyer beware” situation that non-enthusiasts are likely best to avoid. Nerf enthusiasts complained for years that Nerf darts themselves were the main thing holding back performance, both in accuracy and in flight distance. Hasbro responded by releasing Nerf Elite darts, which performed slightly better than previous streamline darts but still weren’t terribly accurate. Enthusiasts weren’t satisfied, so the higher-performing RIVAL line of blasters and corresponding High Impact Rounds (HIR) were released in 2015. These round, foam-based balls are the only ammo type available for RIVAL, and they do offer performance increases versus previous Nerf options. But RIVAL is meant for older players only (due to higher ammo velocities), and HIRs are still prone to accuracy issues over longer distances. Fortunately, there’s another option, but it’s not from Nerf. Mattel’s BOOMco line of blasters uses a unique, plastic straw-like form of ammunition with a rubbery tip called Smart Stick. These Smart Stick darts are only for use in BOOMco blasters, unfortunately, but they do everything Nerf darts can’t—BOOMco Smart Stick darts are super accurate, they hit with noticeable impact, they stick to Smart Stick-backed targets, they’re virtually impossible to destroy, and they never jam. But it bears repeating that BOOMco darts are not cross-compatible with Nerf darts, so using these darts requires an investment in the BOOMco system, which has not yet gained widespread acceptance. It's clear that even non-modified Nerf blasters can be improved upon with a simple change of dart type. Unfortunately, there’s no “magic bullet” Nerf dart that will be all things to all people. For that, you may need to consider moving outside the Nerf system, and all the support and community of players that go along with it. Children's Books With Rocking Grandparents! Is the BOOMco Colossal Blitz the Best Dart Blaster Ever Made? Is BOOMco better than Nerf?